Desperate to get your hands on tickets to see your favourite band play live? Or perhaps you’re searching for last minute entrance to that sold-out show? Whatever you’re looking for you’ll find it at getmein.com – and with a Get Me In discount code you can make big savings too! From the best stand up comedy and live theatre to musical gigs across a wide range of genres, Get Me In voucher codes will help you plan your night out for less. Get Me In is a part of Ticketmaster, the renowned ticket selling company that’s responsible for a huge chunk of UK ticket and event sales. As an open marketplace, it’s a great place for music and entertainment enthusiasts who understand that plans can always change – because each ticket you buy comes complete with a guarantee of a full refund or a ticket replacement should you need to amend your booking. What’s more, Get Me In also offers the opportunity to make big savings with a Get Me In discount code! As an official ticket marketplace, they provide a safe and secure platform for the purchasing and resale of live entertainment tickets – always protected by their extensive guarantee. So whether you’re looking for concert tickets, comedy tickets, sporting tickets or other events, they’ll help you find exactly what you’re looking for. And don’t forget that you can make big savings too when you use Get Me In voucher codes! Left things until the last minute? Don’t panic! With their Last Minute ticket service you can purchase and receive tickets up to a few hours before the event is due to take place. Whether it’s by next day delivery, venue collection or e-tickets, they’ll find a way to get you through those doors and into your seat to enjoy an evening you’ll never forget. Get Me In are specialists in providing tickets for a huge range of events, so whatever you’re into you’re likely to find it catered for here – and with a Get Me In discount code you can afford to treat yourself too. So whether you want to check out the latest pop act or enjoy some nostalgia with a reunion tour from your youth, check out getmein.com and use your Get Me In voucher code for an incredible deal. Browse our website until you find the Get Me In voucher codes that are right for you, then log on to getmein.com to begin searching. Search for or click on the event you are interested in. Select a date and click ‘Buy’. Select your seats and click ‘Buy’. When you’ve finished your order, click to checkout as a guest. Enter your Get Me In discount codes where applicable. 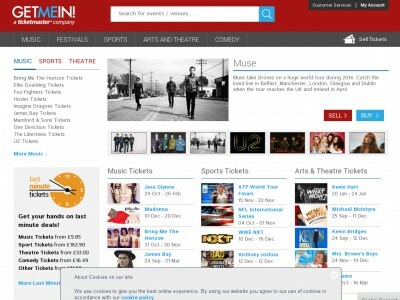 Why wait in line for ages to purchase tickets when you can do so easily and hassle-free at getmein.com? You can even make fantastic savings when you remember to use a Get Me In promo code at the checkout! If you’ve enjoyed shopping for the latest live entertainment tickets with Get Me In you might also like to check out more great deals on similar products at stores like Lovetheatre.com or UK Tickets. Or, if those aren’t right for you, there are plenty more deals to browse in our Music and Movies section. L on to getmein.com to begin searching. Because Get Me In is an online marketplace facilitating the purchase and selling of live entertainment tickets across 100s of venues, they operate a wide selection of delivery options to ensure you receive your tickets in plenty of time. From venue collection to next day delivery, you can choose the method which best suits you. And because they’re a resale site, you can resell the tickets should you be unable to attend any event. Need some help and support using getmein.com? Or perhaps you’re struggling to find the right place to input your Get Me In vouchers? Whatever you need assistance with, their dedicated Customer Service team will be happy to help – contact details can be found here. Want to discover more about the world of Get Me In? Why not follow them across your favourite social media networks? You’ll find lots of exclusive content including event updates, entertainment news, exclusive offers and more. You can also use these pages to find out more about saving money with Get Me In discount codes. At Get Me In they want to make buying and selling tickets to your favourite live music events as easy as ABC – and affordable too! That’s why they run regular offers to help your money stretch even further. For example, right now they’ve got a whole host of last minute deals for music gigs starting at as little as £5.50 a head! And don’t forget to add your Get Me In discount code at the checkout to make even bigger savings! Hate that sinking feeling when you find out you’ve missed out on ticket sales for your favourite band? Or perhaps you’re waiting for a particular act to announce a tour? Whatever you’re looking for, make sure you don’t miss a trick by signing up to the Get Me In newsletter. Packed full of all the latest entertainment news, event announcements, exclusive offers and much more, it’s a great way to ensure you never miss out again. All you need to do to sign up is visit their website and enter your email address to receive regular updates direct to your inbox. You’ll even get notified of all the latest Get Me In voucher codes, so you never need to miss out on the best deals again! Know someone who loves live music? Or perhaps they’re a real comedy and theatre fan? Whatever they’re into, why not give them an amazing gift next time a special occasion rolls around, and treat them to a Get Me In voucher? Available in denominations from as little as £25, gift vouchers can be exchanged for tickets to a wide variety of live entertainment events. And don’t forget to tell the lucky recipient to use a Get Me In voucher code to make savings while they shop! Buy now online at www.getmein.com. I love to attend gigs and shows, but I never remember to get in line when the tickets first go on sale. That’s why I was delighted to discover getmein.com. As a ticket sales and resale marketplace, they often have tickets to sold out events – and you can get them at a great rate with a Get Me In discount code. So whether you like pop, rock or comedy, save on your tickets with Get Me In voucher codes.